Start by refreshing your knowledge of SMART goals. 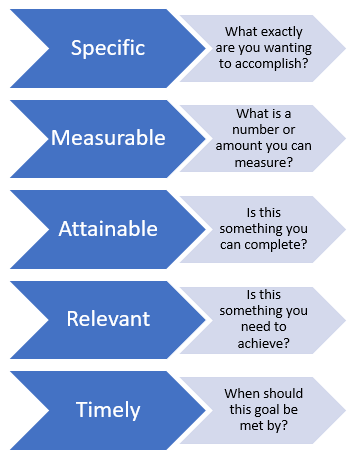 In order for a goal to be SMART, it needs to be specific, measurable, attainable, relevant and timely. Now that we know how to make a good goal, it’s time to decide what will be the most beneficial for you to focus on in the upcoming year. Below are some common problems small business owners face and some coinciding goals that can help provide a solution for each. 1. I'm drowning in my workload. It's very common for small business owners to try and take on the world alone and then end up feeling exhausted and overwhelmed. Instead of repeating that toxic pattern, enlist some help. Goal Example: I will take payroll of my off my plate and assign it to Lisa. I will train Lisa on payroll and she will be solely responsible for payroll by February 28. This will give me two extra hours every week that I can dedicate to my primary job functions. 2. My stream of new leads has tapered off. A new business may be able to rely on its novelty to bring in customers for a while, but you need to actively seek new customers and constantly promote your business if you want to grow. Goal Example: I will acquire 5 new clients within 6 months by asking current clients for referrals and attending 3 networking events. This will increase my revenue and allow me to continue to grow my business. 3. I’m having a hard time competing with large businesses. It can be incredibly difficult for small businesses to break into an industry dominated by big national brands. But it can be achieved by having a solid plan of action. Goal Example: We will create a social media marketing plan that highlights our company’s unique selling proposition. We will use $5 per day to boost our ads for 3 weeks in order to increase our click-through rate. This will help put our message in front of our target market. 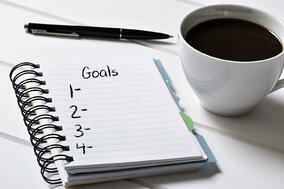 It is important to keep your goals at the forefront of your mind, as well as the minds of your staff. Read over your company goals once a week and check to see how you’ve been doing with them. If you are able to cross something off, don’t forget to celebrate. You and your team worked hard for that victory! Keep in mind that change is okay. If you meet a goal in March that you intended to complete by October, celebrate your hard work, and then try to set a more reasonable goal for October. If a goal that you set in January isn’t really aligned with your company’s direction by the time you reach August, it’s okay to set new goals. If you’re not coming close to reaching your goals, try reevaluating. Is there something you could be doing differently? Could you try a more reasonable amount? Knowing where your small business is going in the upcoming year is essential to your success. Start planning now and be all set to go by the start of the New Year. If you would like some help figuring out where your business technology could take you in 2018, call us at 402.398.9580 to schedule a strategy session.